I had a dream for KILMOON’s cover. I wanted it to look like a “big book.” By this I mean that I wanted my name to be as prominent as the title. In the realm of mystery/suspense/thriller, the bigger the name on the cover, the bigger the author. It’s a branding thing. If your name is above the title — whoa, definite big time! I thought a lot about branding. I thought about what it means to have a series. I wanted my initial cover to include elements that could be used in future covers. I wanted to have a look that lent itself to variations on a theme. I pictured moody. I pictured, of course, Ireland. I pictured a church. 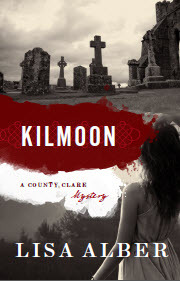 Kilmoon of the title is Kilmoon Church, a place where bad things have happened. She’s almost a character in herself. Setting as character, as we novelists say. Many publishers, small and large, have art departments and many also hire independent artists such as Kimberly Glyder. She has produced covers for publishers such as Houghton Mifflin Harcourt and Crown Publishers and many smaller presses. I’m blessed that she designed my cover! Take a look at the first set of comps she created. Fascinating, right? I was lucky enough to see some notes she’d sent along with the comps. Comp #1: The distressed band could be a key element that repeats on other series designs. It could change slightly and move around, but would always hold the title. The stark images create a bold contrast and set a darker tone. My take: I loved the churchyard — so Kilmoon! But the girl looking off into the distance didn’t feel right for the book. She looked too young and summery. Love the Celtic medallion though. Comp #2: No person on this, but I think the tone is set nicely here. The moon replaces the “o” in the title. The tag line is clearly set under the title, but could move around on other series designs. Author name is quite prominent. More white on here…I could open the white up more too if needed. My take: OK, yeah. I’m liking this one a lot. No surprise, right? I loved the moon in the “o” as a design element. My name’s bigger! Woohoo! 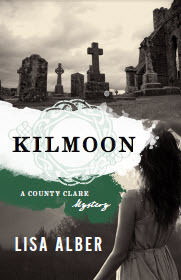 Wasn’t sure about the font for Kilmoon, but I liked the subtitle and especially the Celtic chevron thingies on either end of it. Comp #3: This has a different mood, a bit more color. The tag line can move around the page. I prefer the black and white photos, but wanted to show an option with color. My take: Like that my name was on top — branding! I also liked the stony-looking font for Kilmoon. It’s reminiscent of the limestone that makes up Kilmoon’s crumbling walls. The subtitle within a medallion is cool. However, this was my least favorite cover. Kimberly was right-on that black and white worked better. My take: I’m looking at this one, and I’m looking at comp #2, and I’m torn. I love so many of the elements equally. This medallion with the subtitle is pretty cool too. What I loved? The BLOOD. Yeah, baby! Definitely lends to the mood. Plus the color red complements green — adds a little pizzazz. My name works better here because it stands out more. My take: The red didn’t work for me. So now, let’s take a look at my two favorites and the final version. 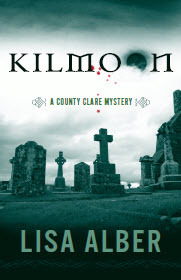 The green and white are brighter and the font for Kilmoon is bigger and more Celtic style. It’s still moody but I think the green and white “pop” more. This is especially important when looking at thumbnail sized covers like you see on Amazon. It’s a shame to lose the moon because I thought that was brilliant, but I like the overall cleaner appearance. The blood’s there — yay! What else? My name is more prominent! Woohoo! 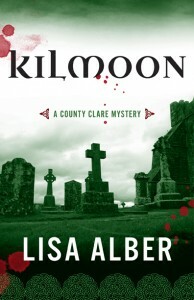 Plus, I love the medallions framing the bottom of the cover — the Irish detail is just perfect. Also, notice how the image is shifted left so you see more of the church’s wall. I didn’t notice this for the longest time. 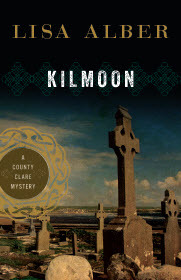 I love it that Kimberly thought of it, because Kilmoon Church’s walled façade is important to the story. Hehe, I can’t wait for you to read it to find out why! <clapping hands> I love my cover! I’m already trying to picture the cover for the second novel in the series, tentatively called Grey Man. This cover so so so lends itself to a series look, don’t you think? What pops out the most to you when you look at these covers? What feeling do you get about the type of mystery I’ve written when you look at the final cover? I love seeing all the different iterations, and how each version got you closer to the actual cover (or if not closer, it helped you realize what was and wasn’t working). It’s interesting, too, to see the creative process at work and realize it’s not all that much different from writing (revise, revise, revise). I agree that this version works great for a series, and I LOVE the pop of color and contrast that the blood creates. I can’t wait to read your book and the next one, and the next one! Wow, I love seeing all these different versions. That’s great that you got to work so closely with the designer. I think it was just different because she’s an independent artist. The press worked with her, but I got to express my opinions. But anyhow, it was cool to be privy to some of the thought processing! Love the cover you choose. It’s perfect (and that’s with my designer eye, coming from my dual-headed career). Your book (honestly) is one I really want to read. I’ve mentioned my husband’s family is from Ireland; have traveled there and loved the country and the people. I also think it’s fantastic how you blogged about your cover. Never would have thought to do that. I had similar ideas putting my cover together regarding the size, shape and prominence one’s heading (and one’s name) should be. All such exciting stuff, isn’t it. Congratulations. Thanks, Sherry! It means a lot to me that you’re keen to read KILMOON! I can’t wait to get back to Ireland. I’m glad it all worked out for the cover. It’s really close to what I dreamed. About as close as I could get, given all the factors that I don’t even know about that go into it. I love seeing this evolution! I know what you mean about being torn about elements you love (e.g. the moon) because you know they won’t render as well in the quick look someone gives a cover. You ended up with a gorgeous cover. Thanks, Gigi! 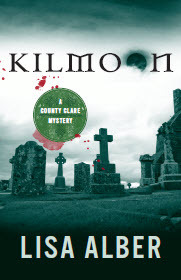 And you’re right about the moon–rendered “Kilmoon” into “Kilmon” with a quick look. I wondered how confusing it would be when looked at in thumbnail size. The green, gloom, and blood would make me pick up the book–it certainly stands out! 🙂 Green, gloom, and blood — that’s the concept in a nutshell, isn’t it? That was fun to see all of the different options. I loved the moon, too. It’s too bad that had to go, but I love your cover now as is! Thanks for this post. As others have commented it is so neat to be able to see the evolution. I agree the final version is my favorite. However,I like the medallion framing the title in number one. It adds a Celtic ghostlike quality and the way it is rendered reminds me simultaneously of the moon and fog or mist. It shows up again in large form in the color one but i like it less there. I’m glad the small medallions showed up again in the final version. The blood splatters really draw the eye and set the tone nicely (I presume.) I think if you write a series it would be an element that I’d like to see on all the covers! Can’t wait to hoist a pint and toast you and your book release! I agree. The medallion in the first comp is great. I love that you can do pretty much anything design-wise with a medallion. It could appear like that on a future cover, who knows? It’s a cool repeatable element. And the blood — so yes! Honestly,I had never given too much though to covers before. I know what I want for my cover, but I didn’t look at it from a marketing angle. My name in big print? Yeah, why not? I am already kind of branded as “me” with my niche. Makes sense. With my current day job, I’m seeing more and more how not just important but IMPERATIVE it is to have the right headline. Same thing with a title. It is the first thing readers see before asking for more. I’m always shocked when we get articles from our contributors with titles like Unhinged. Unhinged from what? An accidental death? A horrible breakup? A french milking cart? From all these posts, I’m seeing the strategy behind the art, and I really do believe that is a HUGE part of writing and often so underlooked when we think “Oh, talent will get me there!” Um, no. Both are incredibly important. Re: your covers, I like your choice! Can’t tell if it’s the green one or the more gray one though? Am I just in a work induced coma? Regardless of color (like the green, for the record) I 100% agree with not using one with the girl. It’s kind of Anne of Green Gables goes to Universal Studios Night of Frights. I am not a fan of blood, but I can see why you like it. It definitely makes a statement. And I’m done with this comment! Andrea, hi! Thanks for commenting. Book covers are fascinating — I never gave them much thought either until I started imagining what mine might look like and then examining book covers at the book store — especially in my genre. I’ve seen the importance of headlines for blogging. I’ve learned a lot from being here on The Debutante Ball.